The sallet also called a salade was a war helmet that replaced the bascinet in northern Europe during the mid-15th century. The Deep Visored Sallet Helm has a continuous occularia or eye slit in the visor. Forged of gauge heavy steel. 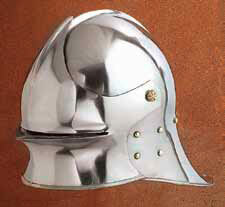 A late fifteenth-century German sallet, with bevor. This page was last modified on 4 May 2014, at 18:06.